The Drag and drop content type allows learners to drag a piece of text or an image and drop it on one or more corresponding dropzones. Drag and drop can be used to test the learner's knowledge on a given topic as a variation to Multichoice questions. Drag and drop can be used stand-alone or they can be included in Question sets, Interactive Videos or Presentations. Either way, they are created in the same way. Navigate to the menu that enables you to create new content. In Drupal, you select Interactive content. In WordPress you press Add new under H5P Content in the admin menu. Select the Create option for H5P. If you find Drag and drop question in the list of Content types, skip to Step 1. You will now find Drag and drop question in the Content type list when creating a new H5P. The juicy, usually red, edible fruit of certain plants of the genus Fragaria. Head over to where you usually create new content on your platform. In Drupal you go to Create content and select Interactive content. In WordPress you select H5P Content and Add new from the admin menu. 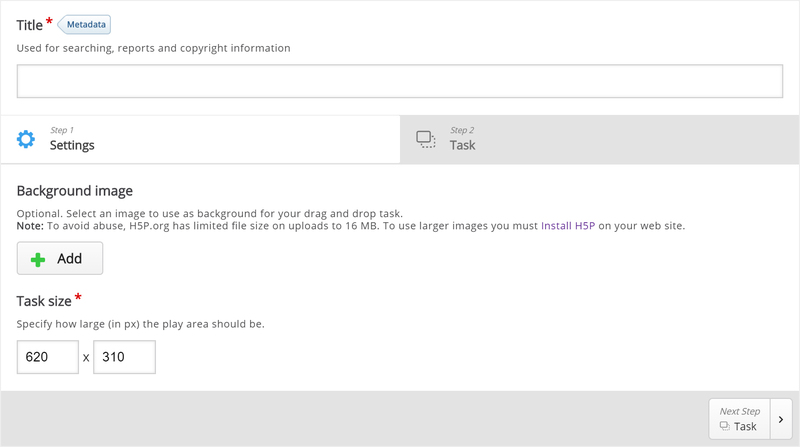 Then select the Create option for H5P and choose Drag and drop question from the list of Content types. We'll focus on creating the Drag and drop question content in this tutorial. The content creation happens in the top part of the editor, so we'll focus on this part here. There are two steps in creating a Drag and drop question: Settings and Task. You can press the Settings and Task tabs at the top of the editor at any time to navigate between the views. Settings deals with general settings such as background image and size. The picture was downloaded from Wikimedia and is licensed with Creative Commons Attribution Share Alike. Press the button to add a background image. Browse to where you downloaded the strawberry image above and select it. The Year(s) field is not relevant in this context so we'll leave this blank. Now that we've added a background image, I can define the size of the Drag and drop question. Since the image has a width of 800 px and a height of 532 px, I'll use this size for the task. The Drag and drop question will be scaled to the maximum width of the page where it is placed, after saving. The Size defines the width and height of the editor as well as the aspect ratio of the Drag and drop question, rather than the actual size in pixels when it is viewed. Since we want learners to be able to try to solve the Drag and drop question multiple times, as opposed to only have one go, we'll check the Enable "Retry" option. The Give one point for the whole task option is more relevant when we add Drag and drop question to Question sets, Interactive Videos or Presentations. This option controls the score the learner gets for solving the Drag and Drop question when it is placed in a sequence of multiple tasks. Since we are creating a stand-alone Drag and drop question, it doesn't matter whether we'll leave this option checked or not. Press the Task tab in the top right half of the editor to start creating the task itself. You'll see that the background image is displayed with the size defined in the Settings tab. 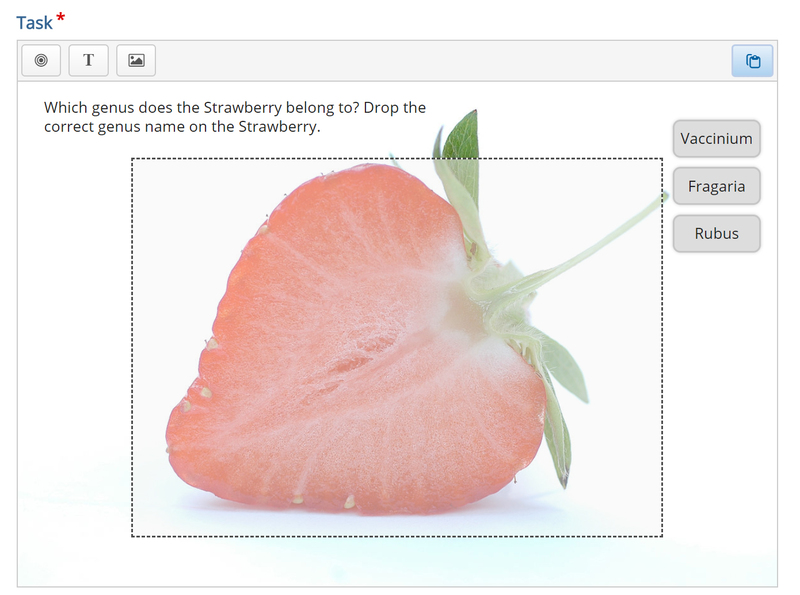 We'll create a Drag and drop question where the user tries to associate the strawberry with its corresponding genus name. According to Wikipedia, a genus is a taxonomic rank used in the biological classification of living and fossil organisms. From the example text above, we know that the strawberry belongs to the Fragaria genus. Other examples of berry genuses are Rubus (e.g. Raspberries) and Vaccinnium (e.g. Blueberries). We'll use these last two examples as false alternatives. You will see a toolbar above the background image. Dropzones are areas on which Text and Image draggable elements can be dropped. 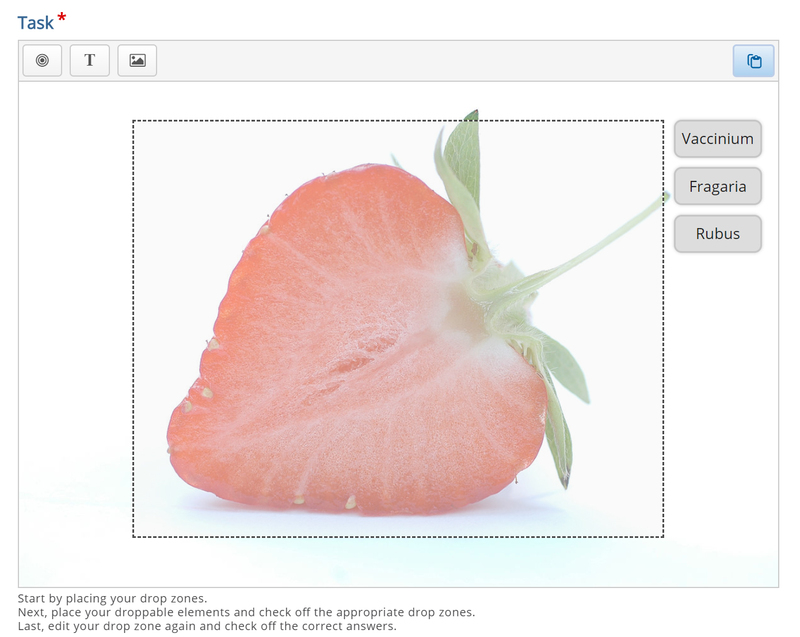 We start off by adding a Dropzone over the strawberry shown in the background image. Press the Dropzone button in the toolbar, drag it onto the background image and drop it somewhere above the strawberry. Dropzone options appear when you drop it. We add the Label Fragaria, which is the name of the genus the Strawberry belongs to. Set the opacity to 50 to make it semi-transparent. You will now see a white dropzone placed over the background image. 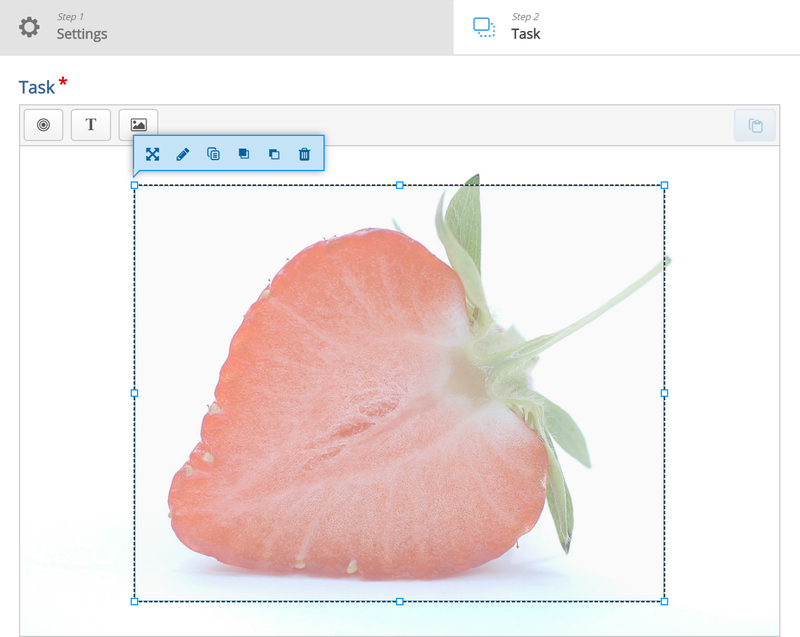 Move and resize the dropzone so that it is placed roughly over the Strawberry in the background image. You move the dropzone by pressing and dragging it to where you want it placed. You resize the dropzone by pressing the lower right corner of the dropzone and dragging up/down or left/right to scale the dropzone to the right proportions. Double-press the dropzone to edit it at any time. In this tutorial we'll add three Text draggable elements; one correct and two incorrect. Images can be used as draggable elements in the same way as Text. Press the Text button in the toolbar and drag it onto the background image. You can place it to the right of the strawberry. Text options appear when you drop it. In the Label field, type in Vaccinium. Under Select drop zones, check the Fragaria checkbox. 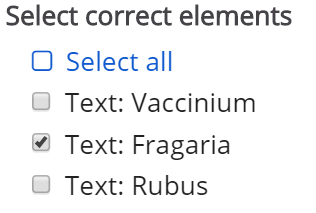 We know this is an incorrect match, however, we want the learner to be able to drop the Vaccinium object on the Fragaria dropzone. If this option was unchecked, the learner would not have been allowed to drop the object on the dropzone. This is more relevant in cases where you have more than one dropzone. Leave the opacity to 100 and press Done. You will now see the Vaccinium draggable object where you placed it. Move and resize the draggable object as you please. You move it around by pressing on it and then drag it to where you want it. You resize by pressing in the lower right corner of the object and then pull in any direction to scale. Add two more Text draggable elements by following the exact same procedure as above. However, label these elements Fragaria and Rubus respectively. Place them in a neat alignment to the right of the Strawberry. Double-press the draggable object to edit it at any time. In order to define which match between dropzone and draggable elements is correct, you double-press on the dropzone. This will bring up the same dropzone options as in Step 5. Since you have defined an association between the three draggable elements and the Fragaria dropzone in the previous step, you will now see a Select correct elements option. Check the Text: Fragaria checkbox to define this draggable object as the correct match. Now, set the opacity to 0 (zero) and press Done. Multiple correct elements can be placed on a dropzone. We are now more or less finished. We might want to add an instructional text such as: Which genus does the Strawberry belong to? Drop the correct genus name on the Strawberry. This is done by adding a Text element and type in our instructions in the Label field. As instructional text should not be a draggable element, we do not select a corresponding dropzone. Place the instructional text in the top right corner and resize it as you please. Save the node/article to view your finished Drag and drop question. You should now have the same result as the example. I've opened this page in Chrome, FireFox and IE and no graphics are visible. In Chrome, I can see a "container" where a graphic should be. And, if I right-click on a graphic and tell it to open in a new tab, I get an "403, Forbidden!" error. In Firefox, there are no graphics and no indication that there should be. In IE, I see a large white space where a graphic should be with a little dark grey X where a corner of the graphic might be. The same holds true for graphics in the other tutorials as well. What's up with your graphics? Thank you for reporting this. It is now fixed! Is this H5P available externally, or could you attach the h5p to a comment here? I just tried creating a drag an drop question on another site which is located on a different server. It worked just fine. I don't know what the difference is between the server settings if that is the root cause. I am using h5P on http://ballaratcommunitygarden.org.au/kidplots and on http://dedide.info/xwtest/test-yourself if you want to take a look. I visited your two sites, but were not able to see any drag and drops? Do you have a publicly available drag and drop showing this problem? I will have one up on the site were I can get it to work. On the other site, I can't get passed the stage of dragging the dropzone button, so cannot even make an example. Now I follow you. You are not able to drag the dropzone button from the toolbar when you are in the editor, right? Hi again, yes that is exactly the problem. Is there any other info I can give you that might be useful for troubleshooting? Are these the versions I should have? If a drag and drop question is created without adding dropzones or draggables, then saved and then reopened for edit, it will fail. This is clearly a bug. We will fix this for the next release. For now, just delete the one you have created, start over with a new Drag and drop question, add an image, and be sure to add a dropzone and draggable before you save it the first time! I cannot find the Drag and Drop in the "select content type" drop down list on H5P site. Is it not available anymore? Thanks! Gave you access to it now. Gave you access to it now. Please share any feedback with us. Is it really hard to use drag and drop? It would be nice to test/use this feature also in H5P.org, is possible in future? Yes, it might be possible in the future. I've given you access to it now. Please share any feedback you might have. Is it really hard to use as we expect? Thanx, I tested it. It is quite nice. I did some picture where I drag&drop some text to right places. You are right, it needs maybe too many mouse clicks to make things happen in needed way (and you have to jump between dropping zone <-> advanced texts). But I manged to do it and actually this is very nice feature to use in e.g primary/secondary schools. Great work! By the way other thing that came my mind is, are you planning to do such a version that don't need PHP? I'm glad you were able to use it. There will be a version that doesn't require PHP, but it will take a while. Great, we are looking forward to take on use version which doesn't require PHP. Do you have anymore plan to make version that doesn't require PHP? Thanx for information. I'm quite novice in NodeJS, and maybe that's why I ask stupid questions. But I tried CLI tool, and I started h5p server. Then I noticed that server try to get application.js, but there isn't that file in scripts directory that I got from git? What exactly is the error message you see? Is it in your browser, or in your console? Could you paste the error message here? You shouldn't worry about the application.js not being loaded. The same happens here, but it doesn't make anything fail. Actually, it is not in use by the developer tool yet. You may remove the line including this file in h5p-server.js, but I don't think it will help you. I think your problem is somehow related to the setup. Although you can drag the text around, when you start dragging some text the correct drop zone becomes highlighted with a dotted line. I notice this also happens on your strawberry example. Am I using the tool in the wrong context? Oh, great, that was my problem too! I works! :) P. s. I'm new in h5p and I love it! Very good point I agree. That worked! You're right, wasnt obvious but now I know what I'm doing thanks again. Thank you for the wonderful tools. I made a drag and drop quiz, but I have a problem with the score it calculates. Even if some answers are correct – and the green graphic checkmarks appear – the score displayed below is “0 out of 16”. It’s strange that it returns the correct result (16 out of 16) if someone gets all the right answers. Thank you. The site is still tested on localhost. Did more testing: Actually, it subtracts the number of wrong answers from the number of right answers: So if I get 7 right answers and 2 wrong answers, it will tell me I got 5 points. How can I make the score show 7 (the no of right answers) instead? Today H5P only have one scoring method, +1 for correct, -1 for incorrect, but 0 is the minimum score, you can never get a negative total score. There will be more scoring methods in future versions, and the current one will be explained better. The H5P core team will be happy to receive patches for it. This is a great content type but the scoring lets it down unfortunately. Hi, unfortunately there have been no updates to the scoring system. However, we'll be happy to review and integrate any solutions that the community comes up with. Is it possible for "My Results" to show the name of teh person logged on my website and attempting Drag and Drop? Also, Can we restrict the number of dragged to 4 (not one) under each drop area? Also, Can "My Results" indicate and record which text was dragged to which Drop area? I'm not sure which platform you are on, but probably yes. "My results" can't do this. And that information seems to be lacking in the xapi integration point. So it's probably going to be difficult to find that out. Access to Drag and Drop? These are simply brilliant tools and exactly what we need. Would it be possible to try out the drag anbd drop feature to test? As hotari mentioned in a previous post, there are lots of very useful interactions we could do with this and I dont know of any other site that allows you to create this. I have posted a fairly long blog on Canvas about your site so hoping it gets you even more enagement and notice. I'm glad to hear that you enjoy H5P and are spreading the word :) You've been given access to all content types now. Stop working properly after the last update - after saving all the drop zones appeared to be messed up. Hi, in what way are they messed up? Is it a bug or a new feature ? 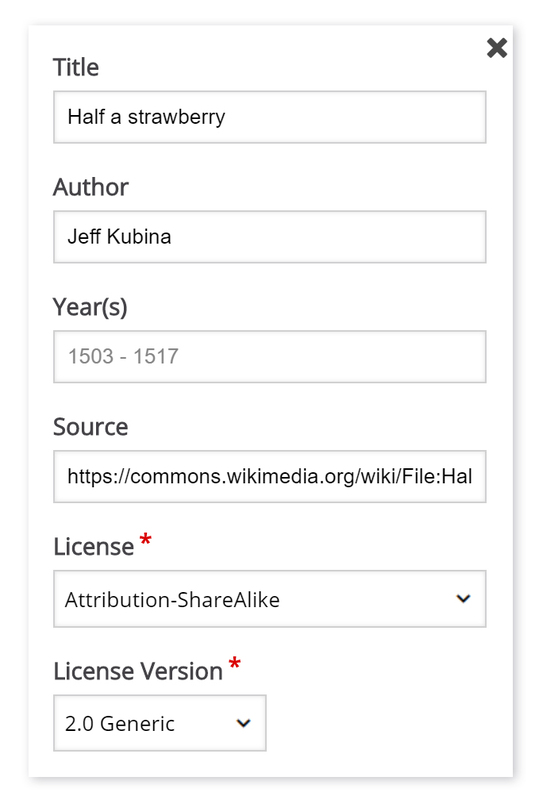 After creating two different fields each having its own multiple correct answers, I have noticed that the the plugin won't allow you to place the "incorrect" answer in the wrong field. This way you have no choice but to chose the once that can actually be dragged and placed only in the correct field. What kind of difficulty is that ? There's no way of getting the wrong answers after all you you won't learn a lot (at least not from your mistakes). Thank you in advance for you answer.